Lace Xclusive's continued interest in providing quality services consistently to our customers is the push behind our new Wholesale Hair Extensions Program. We are interested in extending the dominating reputation of our brand to customers with related businesses. 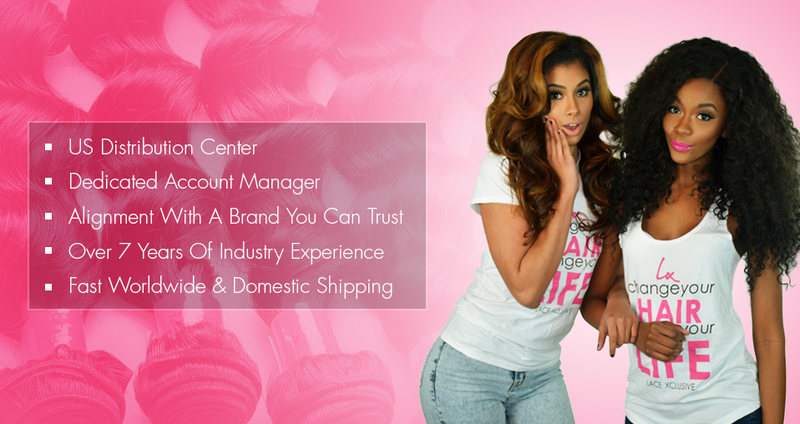 With this opportunity, you get quality virgin hair well below our retail prices. Being one of the fastest-growing and dominating brands in the hair world, Lace Xclusive is known for providing the best quality Unprocessed Virgin Hair Extensions and Wigs. We are conversant with the reality that finding a reputable brand that provides such services is hard. However, look no more, Lace Xclusive is here to save you from further search! By dealing with us, you are certain to enjoy consistent quality, great customer service, and very stable prices. We do the work for you, while you just focus on delivering these quality sales to your clients. Your business soars, and at the same time, your clients are happy. It's a double win! 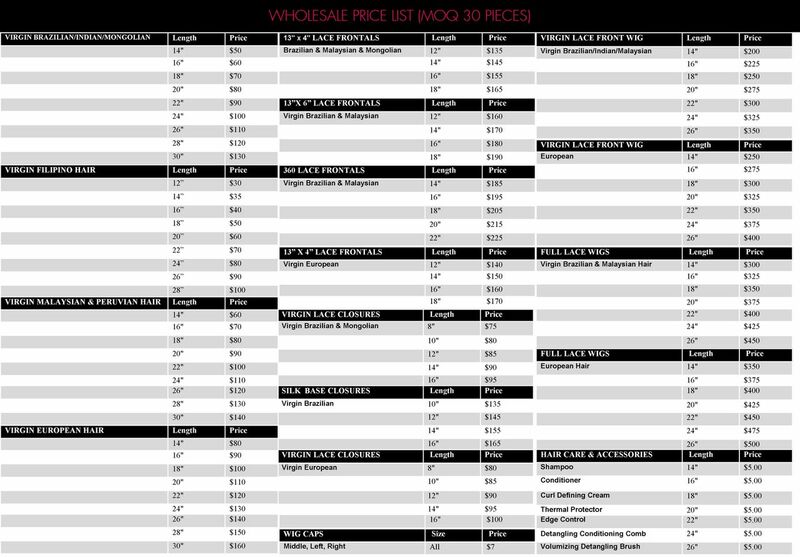 With us, you enjoy wholesale prices for the same hair sold individually in our store and online, or at retailing level with our retailers. U.S. Distribution Center for easy access. Collaboration with a brand having strong network of loyal followers in the U.S and beyond. Dedicated Account Manager for quality services. Over seven years of seasoned industry experience. Fast and reliable worldwide and domestic shipping. You must place your wholesale order online via our website. Once your account has been established and a Wholesale Agreement has been signed we will configure your account so that it will have access to our wholesale pricing via our online store. Your wholesale account will ONLY have access to the wholesale products. If you want to maintain a retail account as well you will have to establish a second account for that purpose. For wholesale orders, please allow up to 20 business days for processing time and 2 - 5 days transit time provided that the items are in stock and there are no problems with the payment verification. We do not process orders on weekends and holidays. The minimum processing time is 1 week. Orders placed on Fridays or holidays will be processed the following business day. Please review your order before finalizing payment. We cannot provide modifications after a wholesale order has been placed and paid or fulfilled. Under rare and unusual circumstances insufficient inventory conditions are unavoidable; although we are committed to doing our best in preventing this from happening, in some instances, the inventory on hand is not sufficient to complete an order. If this is the case, items purchased will be back ordered and shipped once inventory levels have been corrected which is usually within a 4 to 6 days, should you choose not to wait you do have the option to cancel your order. Unless you are notified of a back ordered item, your order will ship accordingly. Because we allow for custom mixture of sizes and products it can take time to process your (and others) wholesale orders. The minimum processing time for a Wholesale order is 1 week. Lace Xclusive utilizes fully insured Priority mail “signature required” Packages to ship your product(s) to ensure safe delivery of your order. You may choose to not require insurance but by doing so, you agree to take full responsibility for the safe delivery of your order and agree to hold Lace Xclusive LLC for any orders which are not delivered correctly. Shipping prices vary based on the number of items purchased, as well as the location being shipped to, and the time of shipping requested. Lace Xclusive is unable to make any guarantees of delivery days or times. In cases of errors or delays caused by the shipping carrier, Lace Xclusive will help resolve the issue to the best of our ability, yet we will not be held responsible or liable. For more information on our shipping policy, send us an email at wholesale@lacexclusive.com. We HIGHLY recommend that you sample items of interest prior to establishing a wholesale agreement with us. Because custom processing begins immediately, no cancellations will be allowed or authorized. We do not provide refunds or exchanges on orders on any wholesale order that has been completed payment and shipped. All sales are final and “AS-IS” with no expressed warranty. We do not accept returns unless we initiate the return via a recall or the items are damaged. In order to exchange damaged merchandise, you must call or e-mail Lace Xclusive LLC within 1 business day of receipt of order to obtain an RMA number, and return instructions. Damages due to the US Postal Service or other couriers are to be reported and filed as a claim. IF/AFTER the claim has been approved replacement material will be shipped after receiving the damaged materials back and/or the claim has been awarded the money by our insurer if applicable. As a condition of a return material authorization, you agree to photograph the damaged items, and submit documentation required by our insurer to process a claim for damaged shipments. ALL wholesale account payments will be subject to a “verification” period to verify clearance of the funds before any shipment will be made. After the funds have been properly verified as released and deposited to our accounts, the order will be processed and shipped accordingly. Usually it takes 2-5 business days for funds to clear. Please note that PayPal eChecks can take up to 14 Business Days to clear. Please note the hair will not come with any packaging. Because this is a distribution opportunity, you will be responsible for your own branding and packaging. We will offer assistance regarding graphic designers and printing companies if necessary. Because this is not a distribution opportunity, you will also be responsible for your branding and marketing. We suggest an Markup of $10 - $20 per item. However our wholesale account holders are free to price their product any way they see fit. However, please note it is better to price reasonably and have a repeat customer than to price aggressively and have your client look elsewhere for another product with better pricing. Unfortunately, we do not provide samples. However, you are to welcome to purchase individual products from our main website to sample before placing a wholesale order. You will be assigned a Dedicated Account Manager on your successful registration on the program. Ready to start your own hair business? For more information, questions and pricing please email lacexclusive@yahoo.com.